Hello everyone. Hope you guys had a great 4th of July weekend! I'm going to talk a little about the pie I made for the 4th of July. Unfortunately, it wasn't as good as I planned, but the crust came out almost perfect. 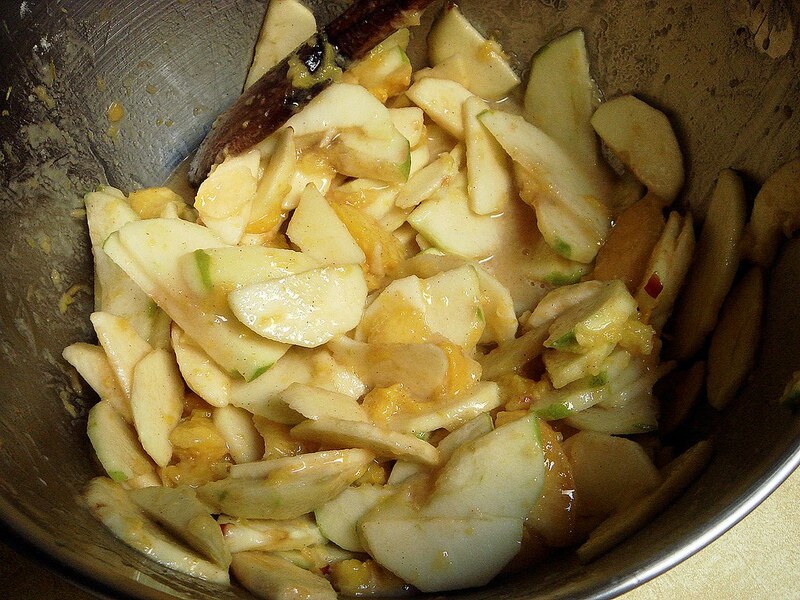 So I set out to make an apple-peach pie, using Martha Stewart's mile high apple pie recipe as a base for the filling. However, the peaches were actually nectarines and was a complete failure. I kept telling myself that the skin on the "peach" didn't seem normal, but it took up to the point of trying to slice the "peach" when I resigned to the fact that I misjudged the fruit. The fruit segments wouldn't separate from the pit, and I ended up having to use my hands to squeeze the flesh off. This didn't even come close to stress relief because I kept calling myself names in my head throughout the entire process. Fortunately, the filling tasted good, though it needed more spices because the flavor didn't come out well in the end. I've been having trouble with pie crust, and I've had my eye on Cassie's recipe for a while now, which I decided to make this time. 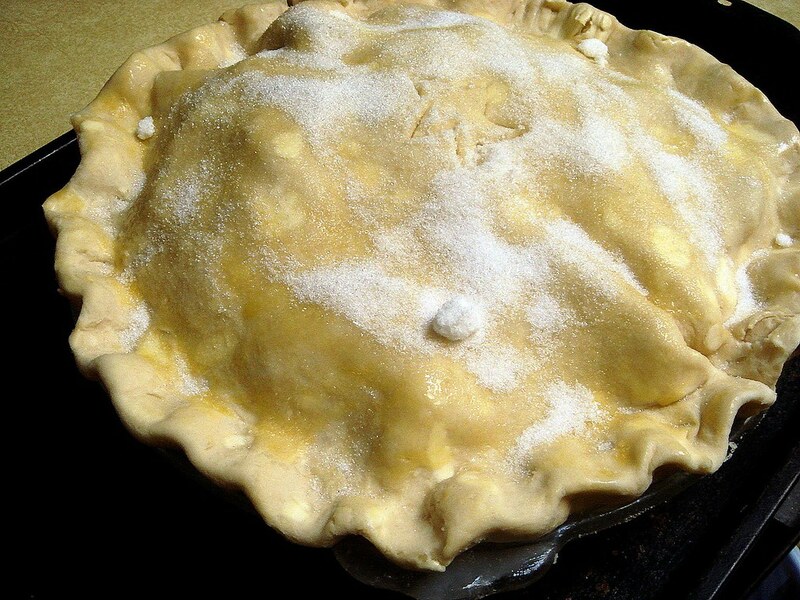 The overall recipe yields enough for a double-crust pie, and includes baking powder. I think it might help to keep the crust from shattering. Both butter and shortening are used here, and since I've come to prefer a butter-shortening crust I have no problem with the inclusion of shortening. I definitely had really great success with this crust, especially considering that I made it by hand instead of in the food processor (I felt lazy). It rolled out nicely enough, though I didn't get it into a perfect circle. 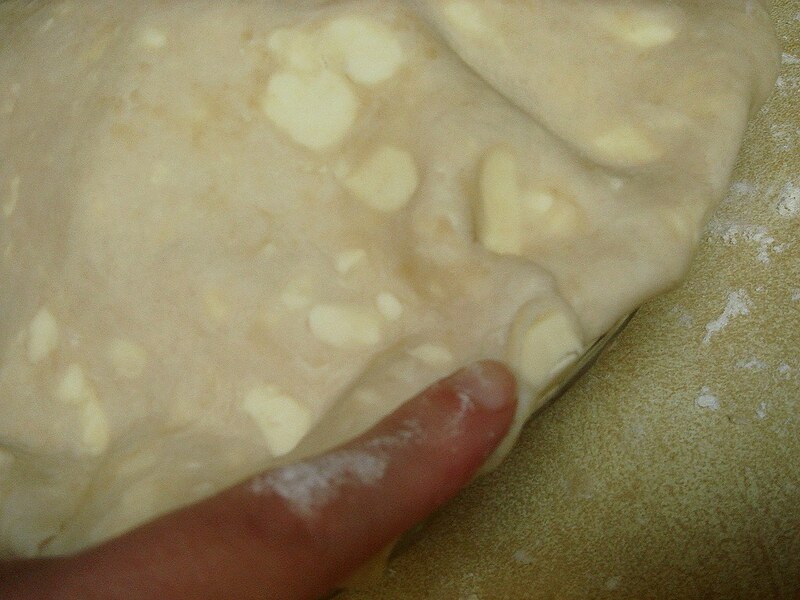 Sometimes when I'm forming the dough into discs there are areas that look like a crack. 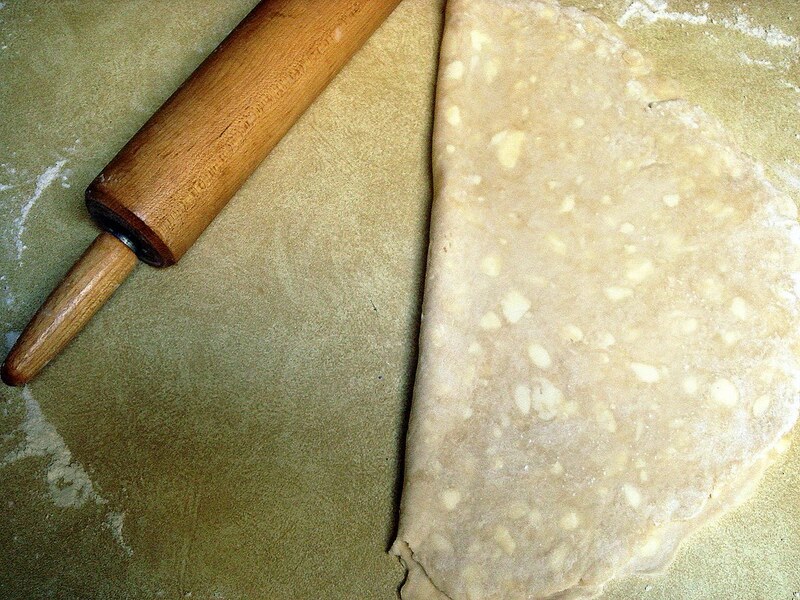 When there are "cracks", the dough separates at the crack when you try and roll it out. It's fine if you can manage to keep the separated areas at the edges that can be covered with the top crust, otherwise you look like a failure. Or not you, but me. I get paranoid about overworking the dough so I stop handling it after a while. My concern was the rather large and conspicuous pieces of butter. I know Cassie said she had a mixture of fine, medium, and large chunks, though I wondered if someone it would melt and ruin the shape of the crust. I didn't really have to worry, though, because there wasn't much shrinkage except that the crust still lost it's crimp after baking. I cut a star on top because I'm patriotic like that. May I present you with a beautifully baked pie? I liked the even golden-browning and that the crust was decently thick and mildly flaky. UNFORTUNATELY, I say in all caps, I seem to have this issue with the bottom crust not baking up and coming out like some saggy skin flap. Seriously. I don't really know what I'm doing here because I bake it in the bottom third of the oven, and on a baking sheet (which some pro baker said helps the bottom crust to brown). The only thing I can think of is that it needed longer time, or that the filling was too juicy. As for the filling, it was lacking in flavor. Which is odd because it tasted good before I put it in the pie to bake, though maybe it needs to be overly good before being baked so it ends up as just good when it's finished. At least it looks pretty. Nectarine pie. I feel like that could really catch on. Mmm. Despite the "failure" with the filling (which, I may beg to differ, this is a PIE, afterall, homebaked pies never entirely turn into trainwreck), I think your pie looks gorgeous. The star cut ontop really makes its grandness complete. Nice! 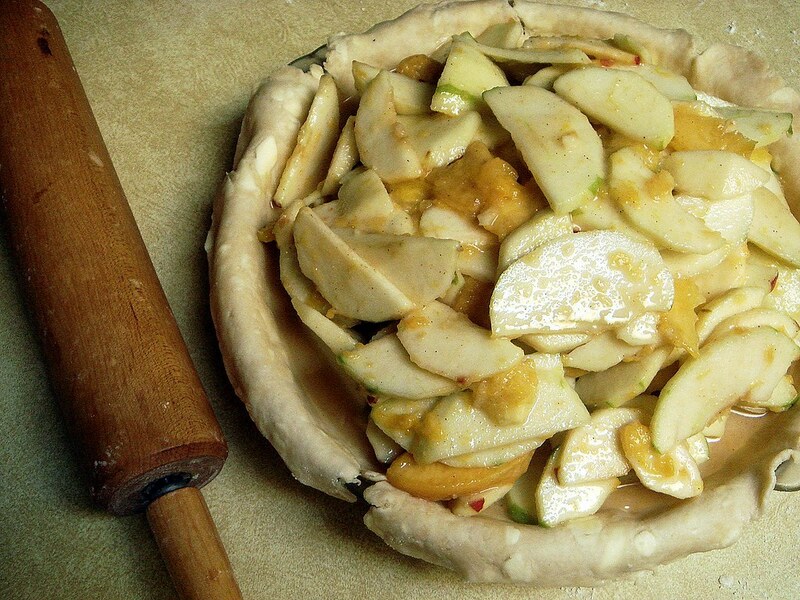 So, you don't bake the pie crust (bottom half), cool and then add the filling? That is what I do. I'm sorry the filling was as awesome as you'd hoped! I'm sure it would have been better with the peaches! But at least you got the pie crust down! I'm sure if you just add a scoop of vanilla ice cream, the lack of flavor in the pie filling wouldn't even be noticed! At least its a pretty pie! 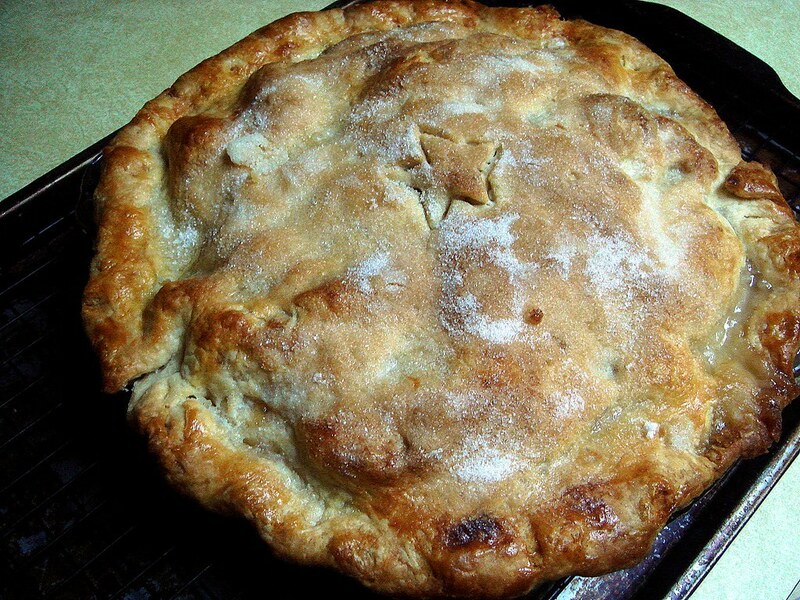 Great apple pie. I could really go for a slice. Why are nectarines so tricky? I got upset the last time I had one and couldn't get the flesh to come off the skin. So frustrating! Your pie looks great, though I'm sorry that the filing was sub-par in terms of tastiness. at least it LOOKS awesome, right? I get so disappointed with failures in the kitchen, I feel ya! but I was going to ask what different spice you used.